From March 8 to March 17, the students of Syracuse University and the State University of New York of Environmental Science and Forestry (SUNY ESF) began their spring break. For many students, they spent their week off from class by heading to Miami, Punta Cana, and just about anywhere to enjoy some warm weather with their friends. 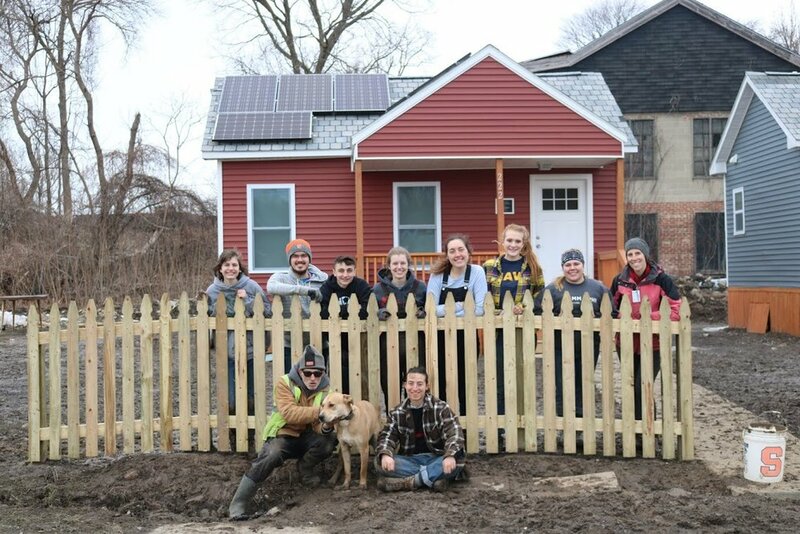 This kind of spring break, however, was not the case for 15 students from SUNY ESF, who spent this week helping out A Tiny Home for Good with their newest developments. For the fourth year in a row, A Tiny Home for Good has hosted a group of SUNY ESF students over their spring breaks. In 2016, the Department of Student Affairs at ESF contacted our founder, Andrew Lunetta, with the idea of hosting a Spring Break service trip here in Syracuse. Two of the student volunteers were Carson Rowe and Lauren Houtenbrink, both sophomores at ESF and first-time volunteers at A Tiny Home for Good. For the 2019 SUNY ESF volunteers, there were two main projects students were working on. Firstly, they helped in framing the walls for two units on the Southside of the city that will be built this summer. Secondly, students helped in building a fence and other site work at the units on Bellevue Avenue, the most recent units that A Tiny Home for Good has opened up. Aside from the two core projects, students also took part in other smaller tasks week like assembling bird houses and clearing some sites for upcoming construction. Outside of working for our organization, they also volunteered serving breakfast at the Samaritan Center and serving meals at both the Rescue Mission and Catholic Charities Men's Shelter. Going forward, A Tiny Home for Good hopes that we can continue this partnership with students over their spring break. We are so thankful for Lauren and Carson, as well as the other 13 students from SUNY ESF for dedicating their time and helping hands in their week off. Because of them, we are closer to opening new units, and continuing to give veterans in need a home of their own.